Before upholstering your car's seats you need to start with a good seat frame. The most beautiful seat covers in existence won't look very good unless the seat's frame, springs, padding and adjustment system are in tip-top condition. This article will show how to repair the seat frames and cut your own foam padding, getting the seat ready for upholstering. Got those tools and your camera ready? Successful repair — not to mention upholstering — whether it be automotive or household, requires attention to detail. Take your time and pay attention as you disassemble a seat. Lay the components (including the old seat cover) out in the order in which they came off. If possible, keep an unfinished seat, cushion, etc. close to the project to use as a reference. You will forget how some items were put together. If no matching piece is available, take photos of the disassembly. In fact, take photos anyway. You'll be glad you did! Our seat as we found it, pretty ratty! The seat frame we rebuilt is of the old coil and band spring type — common to many interior chairs and couches — mounted to a metal frame. In this case (typical for most cars) the base platforms that hold the seat tracks were broken off, requiring a re-weld (easy work for a MIG welder, if you have one, or about $25 worth of repair at a welding shop.) We won't show the welding process, since that's a whole separate how-to article in itself. After weld repairs, all rust was removed. Doing so required various wire brushes, both manual (hand held) and mounted to a drill. After rust removal we coated the frame with paint stripper to bring it down to bare metal. Once the frame was bare and clean we sprayed it with a rust-preventive primer and then a coat of black paint. (We could have sandblasted it bare, but we chose to use up some leftover stripper. Also, we could have powder coated it rather than paint, but there was no hurry to complete the project, so we were able to let the frame dry for a few days. Restoration is all about "flexibility"). Burlap, what's left of it, covers the springs. The bare carcass. It's just a pile of wire and springs. We turned attention to the seat tracks themselves. Like the seat, they were a little rusty and stiff, and clogged with solidified grease. We disassembled and cleaned them for ease of operation, then lubricated them and set them aside after marking them for proper location on the frame. 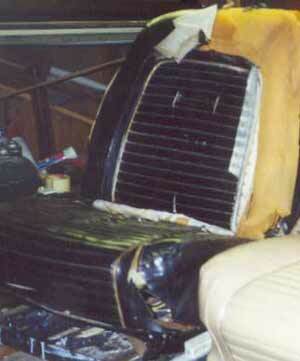 The seat's innards, showing many miles of age and moisture damage. 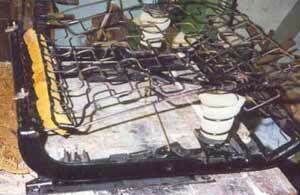 Our springs were still resilient and maintaining shape, so no replacements were required. If they were we could have found an upholstery supplier in the yellow pages and purchased new springs very reasonably. However, we carved a little "cone" of seat foam rubber to act as a core in the two coil springs just to add a little stiffness and to prevent squeaks. The cleaned, painted frame with its foam cones installed. We also laid a piece of foam under the rear spring to act as a sound cushion. 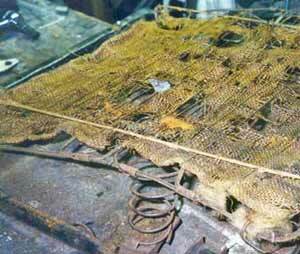 Originally there was a piece of burlap stretched across the seat frame in which were threaded thin wires. 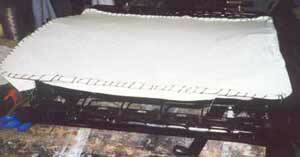 This is a traditional upholstery trick to make all the springs work in unison as the seat is compressed. A far more effective system is to stretch a piece of heavy canvas ($15 per yard at any fabric store) over the frame and around the outer rim. The canvas is stretched and sewed, making the frame nice and tight and ready for foam rubber. We sewed this with a curved needle and heavy thread, stitching about every 1/2 inch. This is a very quick procedure, taking about 20 minutes to cover one frame, and neatness doesn't count. The original inner foam padding will almost always be much too grungy to reuse (foam collapses and powders-up as it ages). While perfectly-shaped, ready-to-use replacements are available for most cars, we prefer to buy higher quality, denser, and therefore more firm, foam locally and carve it into shape ourselves. Your local yellow pages will direct you to foam centers, or you can buy it online. Good foam costs money, so don't be frightened off at the cost. Expect to pay about $50 per seat for top-quality foam. Cutting and shaping the foam is not difficult at all and everyone has the correct tool to do it — the electric carving knife (Yes, finally there's another use for that knife that only comes out of the drawer on Thanksgiving and Christmas!) It is the perfect tool for carving foam rubber and no experience is required. Using the old rubber pieces as patterns, carve new foam into the rough shape and position it on the seat frame. The pieces don't need to be exact, and keep in mind that the old foam has collapsed to some extent. Therefore, your new pieces should be thicker than the originals by 1/4th to 1/3rd of the thickness of your existing foam. When you are satisfied that the "rough shape" is close enough, spray glue the center foam panel (if the seat's foam panels are separate) to the canvas on the seat frame. 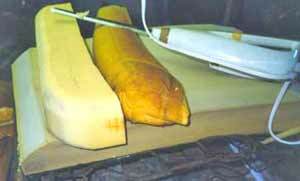 We've carved a side bolster to match the shape--but not the size--of the original, on its right. Underneath, the rough-cut bottom cushion. We used two different densities of foam on our seat. 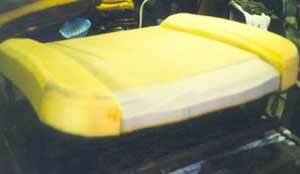 The heaviest density foam is used for the places on the seat that will get the greatest compression (well, you know!) and the less-dense foam is used for the surrounding areas. We do this to make the most comfortable seat and to allow the greatest "malleability" when installing the seat covers. The finished seat core, consisting of the frame, springs, canvas and foam.